Staying at the Poggio alla Rocca, a gaze at the breathtaking panorama is dominate, from the Sienese hills to Montalcino, from the Val d’Orcia to Monte Amiata up until sliding into lower Maremma. One may enjoy an immaculate nature, a sky filled with stars and discover the advantages of the thermal waters just 5km away (Terme of Petriolo). We spent 3 days at Poggio Alla Rocca prior to traveling to San Galgano for our sons wedding. To say this was idyllic is a massive understatement. We were fortunate to have 15 in our group so we had exclusive use of the facilities something made more special by Susanna & Francesco the owners who became more like friends than proprietors. The area is simply stunning and an ideal start to anyone planning a weeding in Tuscany. We are already organising our next stay at this fantastic location. We stayed for a week in June and really loved this place. On arrival the setting and view is just mind-blowing and with the warm Italian welcome from Francesca and Suzanna we knew we had chosen the right place for our stay in Tuscany. The property has been beautifully designed and the outdoor spaces are tastefully decorated with designer outdoor furniture which really made it feel like a small luxury hotel. We loved the infinity pool and the huge variety of outdoor spaces to hang out especially the roof terrace. We spent many evenings up there watching the sunset with a nice glass of wine looking over the valley beyond - pure bliss. Our apartment Sughera was very compact but nicely decorated, small basic kitchen (no oven) but it was close to the pool with a nice grassed outdoor area. We enjoyed a few day trips - Sienna (45 mins); Montalcino (45mins) and Montepulciano (1.5 hours) ... we loved these places and the scenery driving around was beautiful (take the back roads) but were delighted to get back to Poggio alla Rocca at the end of each day. We also had a few days of just chilling at the property and taking it slow which was really nice. Our kids (4 and 6) loved it there and did lots of swimming, hide and seek and walks picking wildflowers. The little village of Pari is very authentic, hardly a tourist in sight - we ate in the village restaurant a few times and the food was great typical Tuscan fare. There is also a very small shop in Pari but best to stock up on supplies before you arrive. All in all we absolutely loved our stay and would highly recommend this place. Wow - this place is really special. Like previous reviewers I was in two minds about writing a review as it's so lovely and beautiful - you want to keep it a secret. However the hosts asked if we would write a review - so here it is. We had one of our bests holidays ever. It's so peaceful and beautiful here and the views are beyond spectacular. I loved going for a morning swim then watching the glorious vista from the infinity pool - heaven. Our villa for a family of four was modern and suited our needs. The hosts are amazkng - so kind, attentive and hospitable. Free caapuccinos, free water daily and even a free pizza and wine party so you can mingle with other guests. I loved this place - it is truly unique and a great base to explore Tuscany. Be prepared that it is slightly out of the way but the bumpy ride in the later part of the journey is worth it when you see the stunning view. Tuscany is truly special but this place made it even more special. We miss it already and I look forward to returning one day soon!! This was our third trip to Tuscany and we did a lot of research to find the perfect places for us. We love small accommodation with only a few others to share with. We always looked out to find places with a great view and a nice outdoor area. We searched in google, with tripadvisor, booking.com and google maps. I must have viewed thousands of pictures taken by owners but mostly by guests to get a real impression of the hotels. And we saved up a lot of money to spend on those trips. Unfortunately the beautiful spots are mostly expensive too. So we ended up paying up to 500,- per night in some of our accommodation. 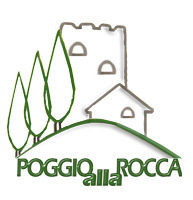 Poggio alla Rocca had the best value for money of the place we stayed and is one out of 3 favorites ! Google gives you a good impression how it looks like and it is just as beautiful. It feels remote but the high way is a short drive away and from there on you get quick to the north or south. If it wasn't for the owner, I wouldn't tell anybody of the spot we found. It's a little place of heaven and I hope it stays that way. Of course it was absolutely clean, the flowers and the garden are well maintained, there is air-condition, a full equipped kitchen, a pool and so on... but you all that information is on the internet as well. Last but not least: The owners are friendly and helpful people. It was our pleasure staying there and we will defiantly come back ! Exceeded my hopes and expectations. I read some great reviews and decided to visit. Minimum stay was two nights, but decided to try it. Glad I did as the hosts, suzzana and Francesco were helpful and kind, sent me to amazing restaurants. Gave me some homemade wine and made me feel at home. Cannot say enough about their retreat. We stayed here for 5 nights as a part of our tour of Tuscany. It was the most relaxing, beautiful spot we could have imagined. The vista really is as good as the pictures show! The rooms are bigger than expected and have a real authentic Italian feel to them. The cottages have everything you could need and the owners really make you feel at home, bringing fresh coffee, homemade cake and a complementary bottle of their local family wine on arrival. The breakfast is a must; homecooked by Susanna as you sit in the old converted barn enjoying a selection of local breakfast supplies. No question or assistance is too big or small and they can give you lots of tips for trips, restaurants and places to see. Our favourite thing was to buy local meats and cheeses during our day of exploring the local towns and at the end of the day sitting out on the patio watching the sunset over the Tuscan hills whilst drinking a bottle of wine. The pool is a beautiful spot for a day of relaxing and reconnecting with nature. I would highly recommend this place if you are looking for a few days of relaxation or as a part of a road tour of Tuscany, as most popular towns are relatively easy to get to. I would recommend you have hire car when staying here. It is a little off the beaten track (sat nav wont find it but you can pick it up on googlemaps once you get to Pari), but the rocky drive to the top of the mountain is worth it for the spectacular views you will have. Poggio alla Rocca will always have a special place in my heart as my boyfriend proposed to me here whist the sun was setting one evening. It is an incredibly beautiful spot and shouldn't be missed. So breathtaking my boyfriend proposed! The best place we’ve been to, in all categories. Most amazons views, peace for the soul. Cappuccino every morning from the best hosts. We Will definetly come back, hopefully planning not to miss the pizza-monday! Thanks for having us, // 3 sisters from Sweden! We stayed only two nights..not enough. Its a very special place with unreal views over the rolling landscape. Very well equipped apartments. New and clean. We bought some of their olive oil. They gave us a bottle of their wine which wad an additional treat. The owners are wonderful, very hospitable. Highly recommend this place. My boyfriend and I stayed here for two nights last week and we totally loved it! We stayed in an apartment by the pool, which overlooks a perfect view of the Tuscan hills. The apartment is more spacious than we expected and had everything we needed. It was clean, cosy and had great facilities. Of course the location is the star attraction, with perfect views even in the rain (which it did a lot whilst we were there unfortunately), but given the beauty of your surroundings, not even rain can get you down. The hotel owners are such wonderful people who truly went above and beyond at every point. They were so friendly and helpful, from offering us a bottle of their own wine (made on location!) to driving and collecting us to and from Pari (the closest village with a fab restaurant serving delicious food). They even let us stay beyond check out time to enjoy the sun that had finally come out for us on the last day! We were sad we hadn’t spent longer here, particularly as it is a great base for exploring vineyards and medieval towns. Perfect!!! ..and more! I do usually write comments unless it is bad but now I feel I need to emphasize how much we enjoyed our time in Poggio alla Rocca. We stayed in both Ginestra (2 days) and Corbezollo(another 2 days) apartments and both were exceptional. The Apartments are very spacious, fully equipped, the view is extraordinary, the pool is crystal clear. I have traveled in many 4 or 5 starts hotels and apartments over the years in vacation and with work and I never felt as good as we did in Poggio Alla Rocca. I want to leave the best things for last and these are Susanna and Francesco, the owners. They are extraordinary people, they made everything for us to have a wonderful stay. Each morning they had prepared caffe for my girlfriend and tea for me with biscuits, no charge. They offered we didn't have to ask. They offered wine also. Everything we ask from them was met with "No problem". We have fallen in love with them and Poggio Alla Rocca and we will definitely come back again. We booked this wonderful place for our honeymoon and it was better than we could ever have imagined. Francesco and Suzanna are the perfect hosts and can't do enough to make sure you have everything you need! The views are unbelievable and totally unspoilt, the location is tranquil and still close enough to access attractions such as Siena and local small towns for an afternoon exploring. Francesco really knows his stuff and will recommend some of the best restaurants we have ever eaten in. We couldn't have asked for more and will come back as soon as we can! Thank you Poggio Alla Rocca! I was in Italy for a friends wedding and stayed at Poggio alla Rocca. From the moment I arrived Susanna and Francesco were so helpful and welcoming to this beautiful haven. They were both always there to answer questions and give suggestions. ALWAYS offering a lovely latte. They could not have been more gracious. The grounds are beautiful and the pool was amazing. The views incredible. This was not my first time in Italy but I have to say this was the best place I've ever stayed in. 5 stars for Poggio alla Rocca!!!! I can't wait to go back. I've already told many friends about this place and they're looking forward to booking in the future. Undoubtedly the best vacation we've ever had. The place is extremely beautiful with breathtaking view, amazing pool, wonderful clean rooms and facilities. And most importantly the best hosts! Susana and Francesco did everything so that we will have the perfect vacation - and it was! Our stay here was amazing. Exceeded all of our expectations. The view is stunning, spanning the Tuscan countryside. Our hosts were excellent: kind, welcoming, and helpful. They went above and beyond their duties of our hosts, but not in a burdening way. Why we would recommend: views, hospitality, room were neat, showers are nice, nice central location to many nice scenic Tuscan drives and Siena, TVs have satellite and many movies in different languages, washer/dryer convenient, they grow their own spices that you can pick to add to a meal if you cook on the location. GPS is a little hard for this spot, HOWEVER, google maps finds it perfectly so isn't an issue. I would recommend this place to family and friends. Such a special spot. For those with own transport looking to escape to the Italian countryside, this is a great choice. Note that via car, after taking the tight turn off the main road turn left at the gravel crossroads and continue past the first signed accommodation. You're rewarded with a super welcome, serving up home grown wine and a wonderful pool with the most extraordinary views. Come with supplies or venture to nearby Pari or the pizzeria (very good) you go past on the way to poggio. A lovely retreat and a great place to unwind with a book, or simply taking in the views with a cappuccino. Thank you so much to Susanna and Francesco for making our first holiday abroad with our two year old such a good one, particularly after the airport lost our suitcase, which we were without for the whole week. From homemade soup, capuccinos and red wine, to advice on where to buy things, and where to visit, they couldn't have been more helpful. The views from Poggio alla Rocca are beyond stunning, it took your breath away every morning to look out on. Look forward to visiting again with a full set of luggage. Tuscany is beautiful - you may need a car to get to everywhere you'd like to, but the scenery along the way is worth it. We had a great few days in Poggio alla Rocca. Upon arrival the first thing that strikes you is the incredible panorama of the rolling Tuscan hills and distant mountains. The whole property is designed perfectly to make the most of this view with a spotless Terrace and Infinity Pool. There is plenty of space even when all the apartments are full, with plenty of comfortable chairs, loungers etc. The hosts were very approachable and helpful and provided a very attentive service including serving coffee by the pool and providing bottles of home-produced wine. The apartment was comfortable and well furnished, but this almost seems secondary because you will want to spend all your time outdoors! Would love to come back, for longer next time. We stayed at the apartment (Sughera) in early may. When you arrive you are amazed by the view and are still amazed up until the point that you leave. The apartment had a lovely rustic feel, but had modern fitting, furniture etc. also had everything you need for cooking. The pool and common areas very spotless and with so many places within the beautiful gardens, you would never really notice the other guests if all were full. The hosts were very welcoming and a pleasure to chat too. The local town Pari is very picturesque, and only 30 minutes walk or 5 minutes drive. The best views in Tuscany and should be on your list. We had a very nice time with our 3 kids at Poggio alla Rocca. The view is outstanding, the pool great and the village of Pari has a delicious small restaurant at the first floor. Our hosts were very friendly and accommodating. I can especially recommend the apartments Ginestra and Corbezollo. This is a stunning place to stay, relax and enjoy Tuscany. The hosts are a lovely, friendly couple always on hand to offer coffee, ice cream or offer advice. The views are incredible. The rooms authentic and cosy. Would absolutely recommend. Wonderful property. Lovely hosts. Incredible holiday. It's hard to describe Poggio alla Rocca with the usually used adjectives for a hotel because you don't feel like being in a hotel, you feel like you stay with friends. The hosts don't consider themselves as hoteliers, they just want to have a great time with their guests and enjoy meeting new people. Thats what makes this place so wonderfully unique. Its not just the impressive view over Toscany with a perfect pool and tuscany style appartements (and not to forget the endless access to the fantastic red wine produced by the hosts ;P). Its more then that - it's a magical place with a wonderful atmosphere which you have to experience! If there ever was a pool with a view, this is one. But that's just the icing on a perfect combination of comfort, quiet and hospitality. Susanna and Francesco are the perfect hosts: they are there when you need them, but otherwise let you enjoy the place for yourself, and there is a lot to enjoy if you are into a rural retreat. To be more precise, if the setting is rural, the amenities offered are very urban(e). Also a great place to explore the region from, with Siena at 30 km and the sea at 50, though the best part of the day will always be when you reach your home away from home. We had a wonderful, memorable time. Firstly, to stay here a car is essential - do not book unless you have transport. Susanah & Francesco were wonderful hosts: they were always available to assist us but were discreet giving us complete privacy at other times. They added generous touches such as giving us bottles of their own production red wine - delicious! We stayed in the large 3 bedroomed apartment (Sole) which is less than one minute walk to the communal pool area - some may prefer to be in a closer apartment but we liked the feeling of independence just up the road. Our apartment was quite spacious accommodating me, my wife and three teenage daughters (2 shared a large double bed). The accommodation was 'traditional', spacious and clean. All windows had mosquito protection. The kitchen area is small but adequate as we only ate salads, cold meats and cheese at home. The pool and surrounding areas have spectacular views and are finished to a luxurious standard with very high quality furniture and shading along with good outside wi-fi. Tuscany is stunning and this location is great for visiting other towns (Sienna 35mins drive). Favourite places were Montepulciano, Pienza, Montalcino, Montereggione and Sienna, of course. All 5 of us would like to return to Poggio Alla Rocca, thank you Susannah & Francesco for your great hospitality. Would like to keep this Tuscan gem a secret! My family and I stayed at Francesco and Susanna's amazing Poggio alla Rocca for 8 days this summer. We had high expectations after having read all the great reviews of the place, and we can only say that reality beat the expectations. Poggio alla Rocca is located on a hill top with an astonishing view over the Tuscan landscape. The place in itself is kept to high standards, indoors as well as outdoors, and the pool area, with it's infinity pool, beats everything of what we've experienced after 10 years at various agristurismos across Tuscany. What made the stay even more special was how Francesco and Susanna ensures that their guests enjoy their stay. Every morning they come ask you if you'd like a cappuccino or espresso and bring it to your terrasse or the pool along with home made cookies. In the afternoon they serve ice cream to their guests. They help you with recommendations on restaurants and places to visit. And not to forget, they offer free wine... They're simply the perfect hosts! We highly recommend Poggio alla Rocca to everyone who wants to experience the real Tuscany.